Rotodraw is back and better than ever with this Rotodraw Set! Drawing is as easy as Trace-Turn-Draw! 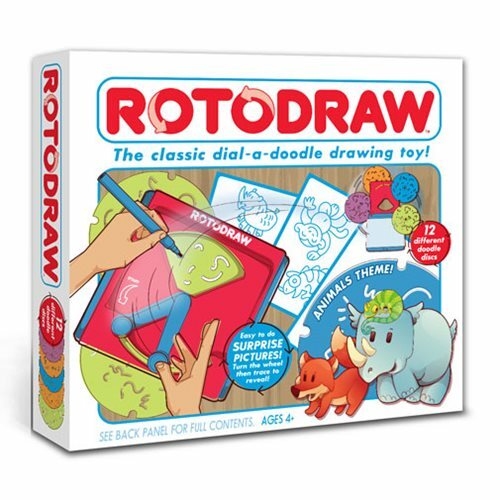 Young artists can easily create adorable characters, animals, faces and more with the classic Rotodraw drawing toy! Insert a Rotodraw Doodle Disc into the drawing tablet, then trace in the lines and turn the crank until your drawing is complete. Set includes design paper, sticker sheets and card sheets for fun character creations. Create a perfect surprise picture every time - just turn the wheel to trace and reveal!